Rationale: The purpose of this lesson is to address the differences that exist in the daily life of the various cultures present in the classroom through the use of the Knights as an example. Students will get to tell parts of their own story as well as work in groups to compile a story through which the diversity of the classroom will surface and thus raise their awareness to the fact that there is no right way, or better way to live, only different ways. Language Goals: The nature of this lesson and the group activity while require students to utilize their listening, speaking, reading, and writing skills. Most notably they'll will need to be able to convey their opinions and discuss various points of view. This will require the use of conditional statements and interrogative sentences. Students will also be required to write a basic outline of their daily life and read it to their group members. This will require the use of declarative sentences to outline each step. Briefly talk about the main points that were covered in the previous lessons on the history of Knights and the weaponry. Read aloud to the class a mock journal entry from a knight, "Alistair"
Their responsibilities? The food they ate? The relationships they had? Compile the ideas presented by the students on the chalkboard in +/- 5 steps. This will be used to illustrate the group activity. 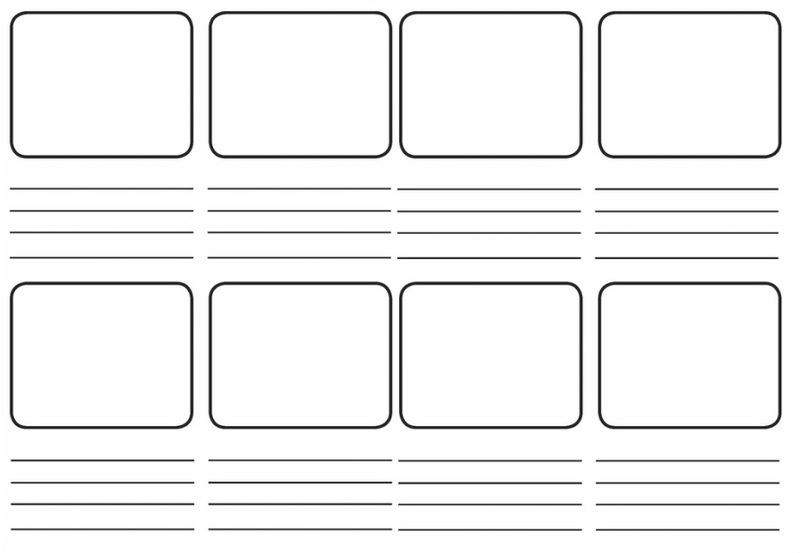 Hand out the Storyboard cut outs with the partial lined section (no picture box side) on the top. Assign students randomly to groups of 5 (30 students / 5 in each group = 6 groups of 5). Each group will create one storyboard together. A storyboard is like a comic strip; it tells a story through pictures which are placed in order of when they happened, like the steps that are written on the board for the Knights daily life. In your group you each have one frame of the total storyboard, which means you will each contribute one picture and then put it all together to complete your story. As students students are working in their group hand out four sheet of the coloured construction paper for students to glue there storyboard frames onto once they are finished, all the while observing their progress and assisting the groups through questions wherever necessary. After 20 minutes or if students finish sooner tell them to glue all the frames on the coloured construction paper in order to complete their storyboard. HOWEVER, only glue the picture portion, leave the written half unglued so it can be flapped over. Have the students tell their story to each other, with each student describing their own frame. Then, flip over the written flap and have each student share one unique part of their daily routine. Ask students if after their storyboard and sharing a unique part of their daily, they learnt something new about one of their classmates OR a part of their daily life that they now know is unique but didn't think was unique before. Organizational and Management Strategies: This lesson in particular encourages student participation, and therefore attention should be paid that all students are equally engaged as possible, and that contributions in the class are positive and not disruptive.The mock diary is intended to be humorous and relatable for students so they are tuned into the story and the task for them is to notice all the difference. Given that the group work is random means that students will most likely be working with students they are unfamiliar with; attention should be paid to which groups require more attention to work effectively as a group. Difficulty in group work is to be expected, if the students had already mastered working in groups, this type of activity would be of little benefit. The group project highlights individual contributions and creativity, therefore students who are otherwise too shy to contribute should be encourage to do so but creating an environment of acceptance among the students by being an example and respecting all students story equally. Overall, how well they are able to grasp the big picture of the lesson: to see all differences as equal, and to think critically about the routines in their daily life. Universal Design for Learning: This lesson could be made inclusive for all students by talking about the objective nature of history, and by allowing for varied responses in student created short stories that reflect their cultural truths. The resulting short stories should be assessed based on overall comprehension, story cohesion, and how well they worked as a group. A group's storyboard need not pertain to anyone culture, rather a diversity within the story will be encouraged, so that each student in the group has something to contribute. After the storyboards are completed and mounted, they can be posted around the room so that students are reminded of the diversity in the classroom and constantly be reminded of the varing points of view that exist.